When M and M were younger I loved creating pretend play areas for them. Taking the pretend play outside was always a special treat! I’ll admit that stretching my creative muscle in that way is something I miss about having preschool age kids. 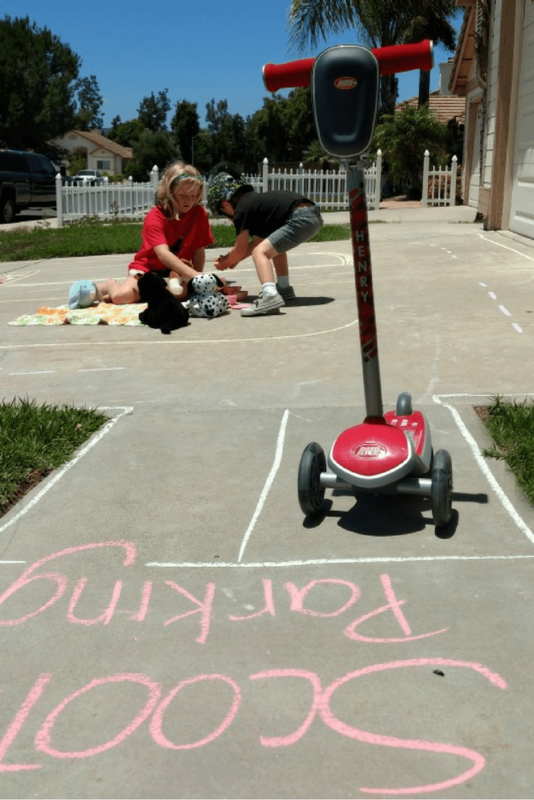 Teaming up with Radio Flyer to celebrate 100 days of Summer gave me the perfect reason to invite over a friend and her 4 year old for some pretend play fun! Radio Flyer is the world’s leading builder of wagons, tricycles, pre-school scooters and other ride-ons. For this activity we used a Radio Flyer Build-a-Scooter. Radio Flyer has been inspiring imagination for 100 years! Check out this adorable Radio Flyer’s Travel Agency. It totally made me want to play! What you need: Chalk, stickers, paper, toys, a little imagination and a scooter. Radio Flyer gave us a Build-a-Scooter to use. Awesome! Our scooter activity had four play areas surrounded by a scooter track. Pet Picnic. In this area I added a few stuffed animals, a blanket and some pretend food. Letter Hop. For the letter hop I wrote all the letters of the alphabet for the kids to use for hopping. Chalk Art. In this area the kids could draw anything they wanted. Mini Tracks. Our little visitor loves anything with wheels so of course we needed an area for cars! I drew a few mini tracks and added some little vehicles. The pretend play fun is in the details. And boy do I love the details. I made a little Ride and Play Passport by cutting up a piece of paper and stapling the side to form a book. We rounded up stickers that matched our scooter areas (or at least came close to matching). Every time our scooter champion finished playing in an area he earned another sticker. I’ll call this ride and play activity a huge success! First. Head over to Radio Flyer and enter the Stars and Stripes Giveaway. Radio Flyer is giving away one toy daily until June 30. Second. Enter for a chance to win a $100 Radio Flyer gift card right here on this post. To enter, leave a comment sharing a summer adventure story (past or present). Giveaway ends June 23, 2017. This giveaway is open to US Residents age 18 or older (or nineteen (19) years of age or older in Alabama and Nebraska). Winners will be selected via random draw and will be notified by e-mail. You will have 2 business days to respond; otherwise a new winner will be selected. This is adorable, and I am definitely going to try it out with my kids – they are no longer preschool age, but I think they’ll love it just the same! This summer we have had some messy adventures – we have already made 4 batches of fluffy slime. It has been perfect for rainy days! My adventure story is happening right now. While we are waiting on completion of our new house, we have moved into my oldest son’s house for about 3-3 1/2 months. I’m living with 3 other adults, 3 boys (6, 5, and 2) and a baby grand daughter of 5 months., 2 dogs and a fish. His fish roommate went to heaven just last week leaving one child in tears. Wednesday’s are my day to do the babysitting while my daughter-in-law goes to work. This Grammie (a speech-language pathologist out on summer break) knows the importance of planned activities as well. But it is a bit more difficult now that all of my things are in storage. To make things even “better”, tonight my 5th grand child came over for a week while her parents are on a mission trip. Radio Flyer could surely help this a Grammie make it through one of my most adventuristic summers ever!!! I so miss being little and using my red wagon to haul our load for our lemonade stand, along with my granddad pulling me around in it. I was so surprised when I thought that it had just disappeared when I got too big for it and years later, my granddad had restored it and gave it to my son. I just wish it had survived him for my granddaughter. As a family, we love exploring our local state park. They have some amazing views, hiking and biking trails, and part of a river runs through the area. We have been going there about once a month for adventures, and our latest outing included kayaking and fishing! My son would LOVE a radio flyer wagon to roll in, and pull. Our messy adventure is a classic. Mud pie kitchen. My kiddos are no longer preschool aged but still love playing in mud. I keep a specified kid area in our yard a well as a cutting garden for them to use to make potions etc. Our adventure is playing life size Hungry Hungry Hippos. We use flat scooters, ball pit balls, and baskets. Divide the kids into teams and give each team a basket and scooter. One child lays on their stomach and holds the basket with their hands while a team member takes their legs and pushes them to the center of the room to collect balls with their baskets. Each child gets a turn on the scooter. The team with the most balls at the end wins. Passing along to our big girls to help with our little girls. Being a mom of 4 boys, every day is an adventure!? We love going hiking, camping in the mountains, bike rides and playing the water! My favorite adventure story was going to the mountains and hiking the trails with our granddaughter as she explored the different trees and plants and we took her Radio Flyer trike so she could ride the trails as well! On a trip to Yellowstone with my sister’s family. Her son Chris (about 5 at the time) was fascinated by the bison, which became pure awe when one decided to drop a giant poop (“Look, Dad, it’s so big!!!”). Later in the day we encountered some older ‘specimens’ and his Dad made a joke about how they were so dry that Chris could probably stand on them. So of course Chris tried. And no, they were nowhere near dry enough. Now we had a child in tears, a really smelly shoe and no spare pair of footwear. The hardest part was trying not to giggle. My favorite part of the summer is always the week we spend at the beach! My hubby’s sister, her hubby & our niece join us, and each of our 2 kids brings a friend! We spend leisurely days on the beach, go out to eat (or sometimes cook in), go to the Boardwalk, and basically just spend a great time together. I wish it could last all summer long! Our family adventure is going hiking and walking trails. Nothing wild and crazy but we have a creek behind our house so every day out there is an adventure in bird watching, finding crayfish, picking snails off rocks, looking for fish, and swimming in the hole! We played with water outside for 2 hours during a recent heat wave. The driveway ended up completely covered in shaving cream and toys (you don’t have to ask the story behind that). It was a great summer adventure! I remember when I was young and we would make plans every summer to go on a big trip. The one year we couldn’t was the year I fell off my bike and broke my leg. I thought it was terrible but my mom planned all these fun activities we could do in our backyard. I remember that summer the most because of that. We love to zipline to the pond! I feel like every day with a toddler is an adventure! This is the first summer that I feel like my daughter really appreciates and enjoys doing things with me so we have been going to lots of farmers markets, play grounds, hiking, etc. It’s been a really fun summer so far! We love to visit the city beach via subway and bus. We always meet a lot of great people and see a lot of sights! We have a great neighborhood for playing around in! Scooters, bikes, chalk, friends, puppies, neighbors. It is truly a ton of fun. When I was young- I visited my aunt’s farm back East. I thought that it would be fun to slide down this hill into a mud pit. The mud pit turned out to be a depository for the farm’s chicken poop. I had to get hosed off and shed my clothes while my mother yelled at me. A few years ago we took a family vacation to Disney World. It was our first time there. All the way back to 1980, summer that year was great. I was 15 and the Texas weather was blistering hot. I went to The Texas Jam that year and saw some amazing rock bands, including Cheap Trick, Foreigner and The Eagles. I had a lot of adventures that summer. We had a vacation at Universal which was our summer adventure. We just took a roadtrip for the first day of Summer. We went to a nearby state and enjoyed a different atmosphere by spending the afternoon near the bay. I loved my red wagon as a child. My sister and I pulled each other all over the neighborhood. We used to go summer fishing. I remember staying with grandparents for a few weeks during summer. My brother and I would ride bikes around town and pick up aluminum cans to recycle. My brother recently passed away and I cherish those summer memories we shared! This year money is tight, so I am taking my boys camping in the backyard. We have a small fire pit we will use to roast hot dogs and make s’mores. We can crawl in the tent and talk about funny or embarrassing things we’ve done. Laughing with my boys is my favorite thing to do. When I was a child, my sister and I loved to put our stuffed animals and dog into our Radio Flyer wagon and take them on all kinds of adventures in the yard. We lived in the woods, so there was all kinds of opportunities for pretending were were on adventures to the moon, damsels in distress, etc. As a kid there are a few things that we did every summer, kind of as traditions i suppose. We always visited a local festival the first weekend of summer. My boyfriend & I went back to that festival this year and all the memories rushed back! It was so nice to go again. My favorite summer adventure story, would be when we went on a hiking trip! My kiddo’s are still little, but now old enough to take on day trips, so we decided to go on a hiking trip and had a blast! We found a huge turtle, saw some deer up close, and had an awesome picnic! It was an amazing day! One of our best summer adventures was taking a road trip to Yellowstone National Park. We love taking our radio flyer strawberry picking. The kids always come home stained with red juice but it’s such a nice way to get outside. Our summer adventure this year will be putting my son in swim lessons and teaching him to ride his bike! When we were kids, summer was one long adventure. My large Radio Flyer wagon held several kids at a time and was often part of our summer adventures. Whether we were pulling it up and down the double driveway or traveling in the yard, we had loads of fun with my Radio Flyer wagon and our vivid imaginations! One of our favorite summer adventures is a road trip to see family in Alabama. We are transported to a different time, where the kids look for lightning bugs at night, share slices of fresh watermelon, and meet at the lake for a picnic. We love the little community parade, where families decorate golf carts, and wagons for the Fourth of July. Decorating our Radio Flyer is always a fun summer adventure. We live about 5 minutes away from the state park. We are always heading up there for adventures with the kids! Whether it’s a day of hiking and geocaching. A trip out to the rocks. Or spending the day on the beach with lots of swimming! Always find something to do up there and never know what type of animals we might see each day. We go Up North every year for a vacation on the beach! I love making those memories! My favorite summer adventure story is the time I went camping for the first time. My cousins joined us and we told stories around the campfire and got in a lot of hiking and got to experience the beauty of nature firsthand. As a family, we love exploring our local Light Houses. They have some amazing views we just can’t get enough of the beautiful views and hiking trails! Love to go hiking and explore new places! Not sure how much of an adventure this is, but recently we have started a garden, both butterfly and vegetable/fruit. We just finished our second round of caterpillars, and now our Milkweed have been picked through (thankfully it grows back quick). We have located 3 Chrysalis, and are waiting for 2 more to open. It’s been adventure because my 7 year old has ASD, and she has never really gotten into something outdoors before. Everyday before ESY she has to check on the Chrysalis and the garden. She is enjoying getting messy in planting things, and has even declared that she will try some of things we are growing. That is huge for her because she has a g-tube and food and her are currently not getting along! It’s also been great to introduce our 3 year old into it. She is getting a great understanding where things come from. Who knew gardening could be such an adventure!?!?!?! Loved going on family adventures with my family when I was young. Our summer adventure is having our almost 4 year old grandson over at least once a week. 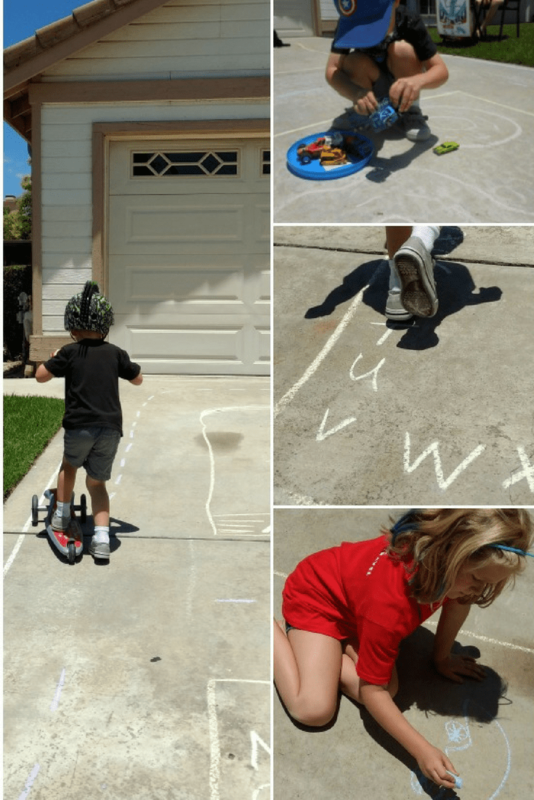 We spend the day swimming in the pool, blowing bubbles, and drawing with chalk on the driveway. My son loves taking his Red Radio Flyer trike everywhere he goes and he loves finding treasures to put in the back compartment. Our summer adventure is visiting a lot of local hiking trails. My daughter and I like to plan a route and a good trail that is manageable for both of us. Hello! I’m a teacher, my summer adventure so far with my little man has included several trips to our botanical gardens. We love the trails and the kids garden with fountains and play areas. I love being able to actually spend time with my little dude. Looking forward to the beach, library trips, and the zoo this summer. ? One summer when my kids where 12 and 10, we drove my Jeep Wrangler from Houston TX to NYC/Washington DC and back over a few days. It was really exciting, wish we had stopped in the mountains we drove through but at least I’ve seen mountains now. The stories we share are continuing with the grandchildren! THe big fish stories are always fun! My sons would always build ramps and jump their bikes into the muddy pond in the middle of the cow pasture. My favorite vacation was when I was 40. My Dad took my family to Disney World for a week. He really showed us a good time. We had a ball. Now, I am planning on taking my own children and grandchildren. Thanks! We try to make every day an adventure with our three kids! This summer we have explored local parks, zoos, and our backyard! We try to do science experiments like making slime and crafts everyday. We would love to get our littlest a radio flyer, so she could enjoy bike rides with her brothers. I love your ideas for ride and play areas. My grandniece loves drawing all over the driveway with chalk, but this would be a much better activity for her when she comes to visit. We had lots of fun a couple weeks ago when she visited. We dragged out all the stuffed animals & dolls for a tea party. She had a blast filling the teapot with soda (she tells her mother we have MILK) and cupcakes. We’ll have to get with her Dad and see about the Build A Scooter, it looks like fun! As kids, we would ride our bike or motorcycles and jump hills and ramps! Sometimes we would tie a rope between the bike and wagon and pull people along with us! We had an amazing summer when we went to space camp!! Celebrate my birthday at Central Park. The first Summer Adventure that I remember was going to a theme park in the Ozarks near our home called Dogpatch USA. My little brother threw up in mom’s lap on the way there. We spent a summer of adventure bird watching and keeping a journal of our finds including sketches. Great exercise on our nature walks and a great learning experience that is exciting and fun. We love to go hiking my daughter loves going up into the mountains to walk around and explore but she is content just walking around the “Hacky-Sack” (cul de sac) in the evenings. I hope this summer is as adventurous as our last summer! We spent a lot of time outdoors last year, exploring the mountains surrounding las Vegas. Beautiful red rocks for hiking and climbing, and going out to Valley of Fire and seeing the incredible nature and history intertwined there. Great opportunity interact with lizards! Summer of 2013 we played hookie from work and got in the car and drove 10 hours from the Midwest to Hilton head island, Sc. Best road trip ever. we go to bushch gardens williamsburg every year and it is the highlight of our summer. we visit the water park and old colonial williamsburg as well. Great fun and memories. My biggest adventure this summer is when my Scotty runs out the front door when a service person comes. Wagons! My kids loved and still love loading, pulling and dumping. Yardwork and groceries can get done more easily with kid help and wagons- keeps’em busy. Summer story… I celebrated the 4th of July at the Oregon Coast for years and years and it was always my favorite! Two years ago my oldest son (4 at the time) and I headed out on a hike. We followed a path and kept walking. The path took us up a hill and the hill started getting steep. Then it ENDED. My son panicked but I made him finish to get to the top. When we came out of the woods I realized where we were. We were 4 miles from our car. My son was such a champ. We walked out to the street and walked all the way back to our car. Since then, he is up for adventure but tells me that we are to ALWAYS stay on the path. Oh and anytime we hike into those woods we are not allowed to follow that trail again! Every year we go camping at the lake. My kids love to go fishing, boating and swimming!! We like to take advantage of the lake we have access to by swimming, paddle boating, fishing, and picnicking! Our fun summer adventure happens every time we visit my parents who have a small farm. My little girl gets to see goats, chickens, ducks, and much more. She loves to go visit all of the animals with her grandpa. It is fun to see her enjoying and learning about all the animals. One summer when I was 14, my brother was 12 and my sister was 9 we stole our neighbors canoe and took it down to the creek behind our house. It has been 14 years and we still tell that story at almost every family event. My summer adventure was a wonderful beach trip with my son, husband, nieces, and other family members. We had an awesome time going to the fun parks at Myrtle Beach, SC and watching my little one enjoy the rides and treats. We had a blast in the Mirror Maze , Boardwalk, and walking out on the ocean. My baby talks about it even now and he can’t wait to go back this summer! We took a family road trip across the country. My theee kids and I flew to Michigan with my dad for a week last week! This was their first time flying and it had been 9 years for me. It was such a fun adventure! My Aunt had an awesome old Radio Flyer wagon with extra large all terrain wheels, my kids loved it!! 🙂 It was by far the best summer trip we have had so far. Last Summer we had a super fun adventure! We went back to my hometown and took a ghost tour with the kids.They loved wandering around the old buildings and using the ghost hunting gadgets.We didn’t see any ghosts,but we did see some wild horses and that was pretty cool.